AWARD WINNING! Our original CLC 'Globe Torch' light fixture was used in a movie. 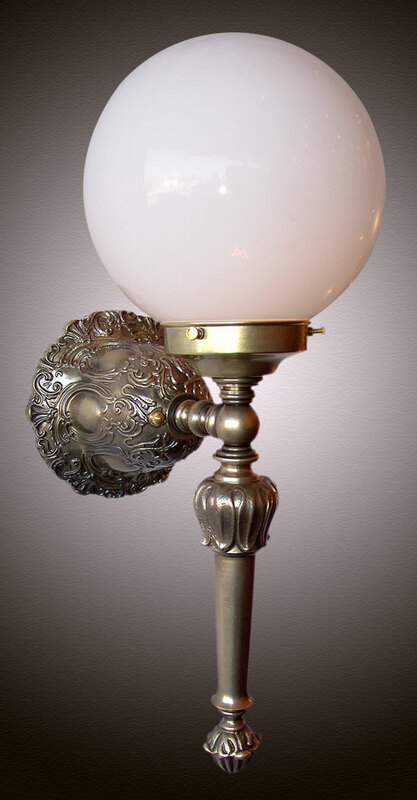 A classy piece for it's refined design and historic accuracy, it features a very ornate Victorian back plate and the stem is one solid piece of cast brass. Imagine these on a dark marble wall, spiraling up a curved wide staircase in a Southern mansion. Now imagine it in YOUR home! Finished in Antique Brass with a clean White Opal glass globe. It's even more beautiful when it's turned on! Width 7 In. / Projection 9 In. / Depth 19 In.